This photographic tribute displays the rich cultural tradition behind New Orleans’ St. Joseph altars and their delicious dishes. 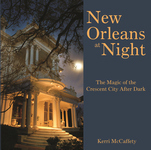 While examining the spiritual significance of the altars and the accompanying foods, author Kerri McCaffety also discusses their cultural importance to both Sicilian Americans and the people of New Orleans. New Orleans is home to one of the largest Sicilian-American populations in the United States, and the community preserves many of its Old World traditions. During the Middle Ages, Sicily went through a period of severe drought. For relief, the people turned to their patron saint, St. Joseph, promising a huge banquet in his honor in return for the needed rain. The tradition evolved and now features today’s St. Joseph altars, constructed in thanks for answered prayers. Every year on March 19, the Feast of St. Joseph, beautiful and elaborate altars are constructed and piled high with delicious food. 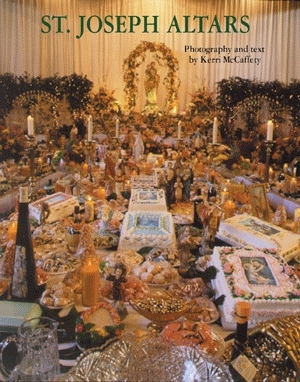 In St. Joseph Altars, Kerri McCaffety combines historical knowledge with luscious photographs of this Sicilian tradition. She took 140 color photographs in thirty different homes to reveal the beauty and majesty of the St. Joseph altars. St. Joseph Altars is also an heirloom cookbook; it contains twenty recipes for several of the most popular St. Joseph altar dishes. Contributed by both Sicilian grandmothers and New Orleans chefs, these traditional recipes include ciabatta (bread), cioppino (fish stew), and various biscotti (cookies). 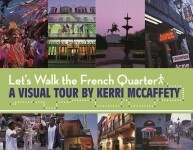 Kerri McCaffety is regarded as New Orleans’ top photographer and is a nationally recognized talent. She is the winner of the 1999 Society of American Travel Writers’ Lowell Thomas Award and two of her books have been selected as finalists for the National Publisher’s Marketing Association’s Benjamin Franklin Awards. 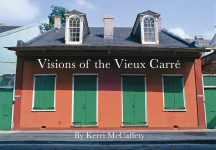 Ms. McCaffety is also the author of The Majesty of the French Quarter, The Majesty of St. Charles Avenue, and Étouffée, Mon Amour: The Great Restaurants of New Orleans, all published by Pelican.